There is increasing demand for more alternatives to gas-powered outdoor power equipment. Makita is meeting demand with an expanding line of cordless OPE that includes the 18-Volt X2 LXT Lithium-Ion (36-Volt) 17 in. Lawn Mower. With zero emissions, lower noise and none of the maintenance associated with gas power equipment, the 18-Volt X2 (36-Volt) Cordless Lawn Mower is a welcome solution for efficient grass cutting. It's powered by (2) 18-Volt LXT batteries (batteries and charger sold separately) for maximum power and run time, but without leaving the 18-Volt battery platform. 125cc Push Gas Lawn Mower 20 inch, PR450N20S The Poulan Pro PR450N20S gas-powered push lawn mower is the perfect choice for mowing small to medium-sized lawns. Lightweight and easy to use, this 20-inch mower features a side discharge cutting deck and is well suited for yards with flat terrain. The compact design means it manoeuvres easily around trees, rocks and flowerbeds to make it a perfect trim mower. The easy starting Briggs & Stratton 450e Series 125cc engine provides 4.5 ft. lbs. gross torque to supply all the power you need along with a fast, reliable starting system to get you mowing quickly. The quick adjust, 5 position lever lets you customize your grass height from .1-inch to 3.5-inch. Unlike similar competitor units, this lightweight mower is fully assembled and ready to use right out of the box. 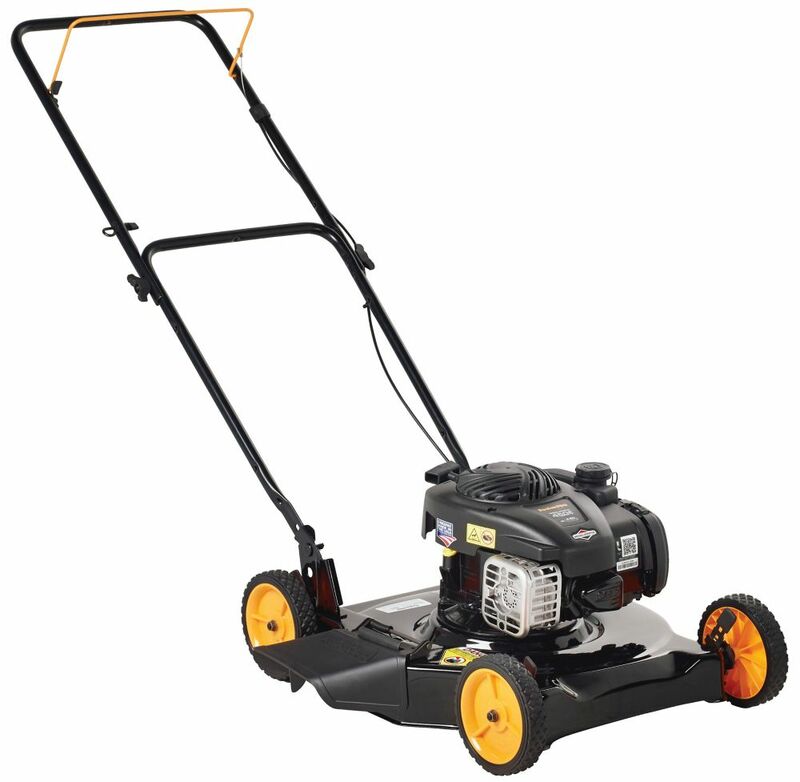 125cc Push Gas Lawn Mower 20 inch, PR450N20S is rated 3.6 out of 5 by 80. Rated 4 out of 5 by Mc from Product works great out of box- deck scratched due to... Product works great out of box- deck scratched due to lack of manufacturer packaging. Rated 1 out of 5 by Belinda from The mower arrived in an open box. There was... The mower arrived in an open box. There was an oil spill in the box. I assumed the mower had been returned. I attempted to use the mower, however the handle was not solidly in the base of the mower, which made mowing difficult. I took the mower back to see if the problem could be fixed. The gentleman who helped, attempted to lower the handle, however one hole was round and the other was square. It could not be moved. I returned the mower.